Uniwave SA, CEO, Patrick Leclerc, with the receiver holding the Di-Wave 100. Photo courtesy of DRM consortium. 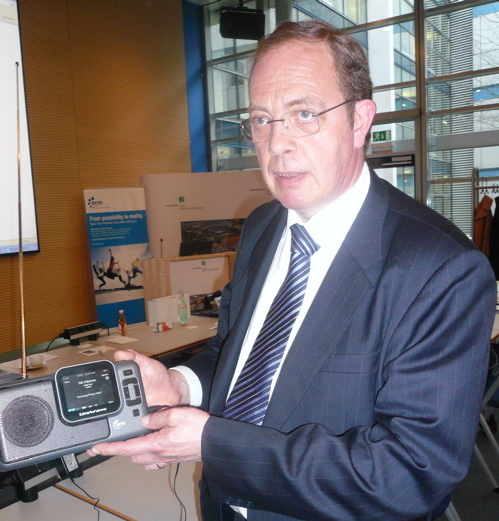 The Di-Wave 100, a new DRM digital radio receiver was unveiled at the annual general assembly of the DRM Consortium in Erlangen, Germany. This is big news indeed for DRM enthusiasts as there are so few versatile stand-alone DRM receivers in production. This announcement also coincides with other exciting news in the DRM world, namely that India and Russia are backing the digital mode for future broadcasts. See press release here. The Di-Wave 100 has a USB/SD card reader and mp3/mp4 play-back. It sports a 3.5 inch TFT color display that reveals station identification, program information, Journaline, MOT Slideshow and listening time shift in several languages. The Di-Wave 100 can receive DRM broadcasts in SW, MW and LW as well as analogue FM and can store 768 stations in its memory. Click here to view in Universal Radio catalog. It should be noted that the Di-Wave 100 will be the first consumer DRM receiver authorized by the FCC for sale in the United States. When FCC approval is granted, the Di-Wave 100 (a.k.a. UniWave Di-Wave) can be purchased from Universal Radio. UPDATE: Universal Radio is now selling the Di-Wave in North America for $299.95 US. The Di-Wave is also available for sale in Thiecom’s online catalog in Germany (249€) and in AV-COMM’s online catalog in Australia ($499AU). Two other distributors in Germany are Charly Hardt and Alan Electronics. This entry was posted in News, Radios and tagged Di-Wave 100, Digital Radio Mondial, DRM, DRM Consortium, DRM receiver, India DRM, Russia DRM, UniWave, UniWave Di-Wave, UniWave DRM, Uniwave SA on March 28, 2009 by Thomas.